My husband and I spent this past weekend in Jackson Hole, Wyoming. Jackson is about five hours from Salt Lake City (where we live). It was so beautiful up there, I just love the Jackson area in the summertime. We spent Sunday on the Snake River with some friends. There was a little bit of fishing, but for the most part we were just hanging out enjoying the beautiful scenery and perfect temperatures. 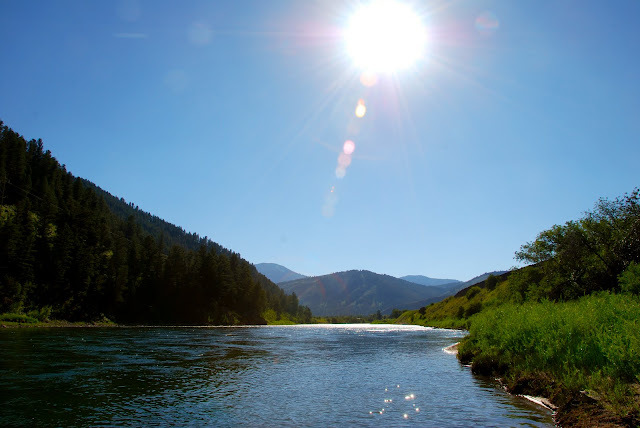 "...the Snake River Plain is believed to be related to the trail of the hot spot currently beneath Yellowstone. I will use an analogy of a blow torch under a plate of steel. If the plate of steel is moving the torch does not have enough time to burn completely through the plate but it will still leave a trail of altered metal. If the plate stops the torch will burn through. Hawaii is a real life analog. If you look a map of the pacific ocean floor you will see a trail of volcanos and sea mounts over 1000 miles log leading from Hawaii, west to Midway Island. These volcanos and seamounts were once over the torch of the mantle plume beneath the pacific plate. A mantle plume is an upwelling of hot material from deep in the Earth vertically to under the crust. In time these plumes can "burn through" and form a volcano. Iceland is another example. The plume believed to be the source of the Snake River Plain is another. It resulted in the catastrophic eruption that formed the Yellowstone Basin and is the current source of the hydrothermal geysers found in the Park.". Photo by me. Not a bad place to spend a Sunday eh? Beatiful and fantastic! I have to admit I am a rock geek. Growing up, I'd make my folks pull off the road at every Rock Shop in the Ozarks and spent a fair amount of my allowance on geodes and such. Now, I have spent an embarassing amount of time in my own home staring at the detail in the granites, slates and marbles we have decorated with. The science behind the beauty makes it that more beautiful. I agree Melissa. When I look at my gorgeous limestone countertops with all the fossils I love it even more knowing the science behind the beauty.